I like fantasy/paranormal books, though these days, it seems like they are mostly found in young adult. I am happy to say I discovered an author who writes adult books in this genre, so I read Crystal Gardens by Amanda Quick. According to her webpage, Amanda Quick is the pen name for Jayne Ann Krentz. Ms. Krentz also writes books under the name of Jayne Castle. She is a busy lady! The first novel in the Ladies of Lantern Street series, the book concerns Evangeline Ames, a single lady of a certain age who, due to her lack of fortune, works as a paid companion. Endowed with paranormal abilities as well, she is able to determine whether suitors for wealthy marriageable young women are all they appear to be. The victim of an attack by one of the rejected men, Evangeline has decided to rent a cottage in the country so she can rest and work on her novel. In addition to her main employment, she also writes. Little Dixby wasn’t chosen at random; Evangeline’s father had always been interested in the paranormal. In fact, he lost all of his money trying to build contraptions that could be powered by paranormal activity. Apparently, Little Dixby was a center of mysterious energy. Unfortunately, foul play has followed Evangeline to Little Dixby in the form of a knife-wielding potential murderer named Sharpy Hobson. After attempting to kill Ms. Ames, Sharpy follows her as she escapes onto the neighboring property. Unhappily, Mr. Hobson meets a gruesome end and fortunately, Ms. Ames meets Lucas Sebastian, new owner of Crystal Gardens. Together, Evangeline and Lucas attempt to find the connection between Ms. Ames and Sharpy Hobson and determine the cause of the inordinate amount of paranormal activity of Crystal Gardens, all while they become entangled in a most unusual courtship. 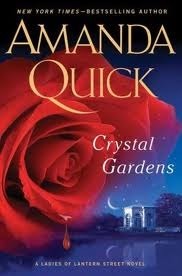 Crystal Gardens by Amanda Quick was published on April 24, 2012 by Putnam Adult.